Made these for dinner tonight and they were AMAZING! My husband and I absolutely loved them! What a great sounding and looking recipe. I’m hungry all of the sudden! Love your passion for food, it really shines through on your site here. Good work! What kind/brand of beer should I use for this? Please help ASAP I’m cooking this tomorrow !!! Josh, I’ve used both Wachusett Blueberry Ale (it’s what I had) and Guinness-both had a great result! Did you drain any of the fat/juice from the meat after cooking it for 8 hours? How lean was the meat you used (ex: 80/20, 90/10, etc.)? Do you think any beer will work with the recipe? I don’t know much about beer. Thanks!!!! This looks amazing! What cut of meat do you recommend using? 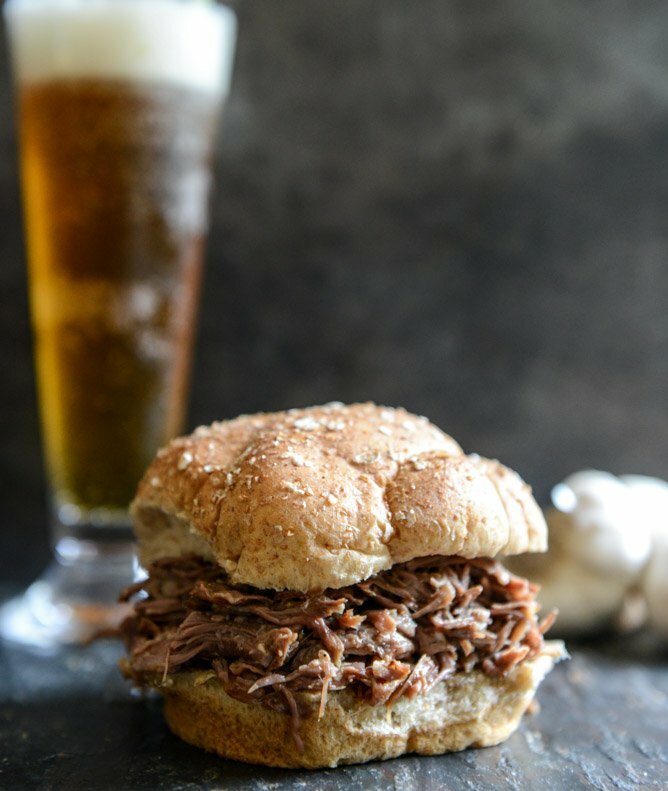 I have never ever liked pot roast (yucky yucky), but I decided to make this to expand my horizons, plus you can’t really go wrong with the beer thing. Best thing I ever did! It was ah-mazing!!! My whole fam loved it, even my picky eaters – this recipe has moved into my favorites arsenal! I made this tonite, and used a sweet raspberry wheat flavored beer. Instead of serving on a bun, we had it with brown rice. It was outstanding! I’ve made this recipe twice before (and am getting ready to do it again today). I have always used venison instead of beef and it is so delicious! You can’t always just substitute them for each other because deer is so lean and easy to overcook, but this recipe keeps it deliciously moist and tender. Everyone loved it! these looks amazing and i can’t wait to try it! Found you from the Foodiecrush list! Made this using pork roast and honey instead of beef and brown sugar. Also added a browning step of the pork before placing it in the slow cooker. It’s great! Question! Can this be cooked for four hours on high instead of 8 on low? I don’t have time to cook it for 8 and I am making this tomorrow! yep, most likely, give or take a little bit! This was very disappointing :( I followed this recipe exactly, and when my pot roast was ready it would not shred. At all. I ended up having to just slice it up and put it back in the pot with the roasted garlic. I was annoyed at not having pulled sandwiches, and then there was way too much garlic. Wasted $20+ on make this. Thumbs down. kira – so sorry this didn’t turn out for you. i would definitely check your crock pot (all are different) because after 8 hours a 4lb roast should definitely shred! with your crock pot, perhaps it needs to be on high heat? the garlic could definitely be overpowering if it’s not able to be mashed in with the pulled roast. Just made it had no issues with texture or flavors. It’s my new favorite crockpot roast recipe. Thanks for sharing! This looks great! What can I use in place of the beer? My husband is allergic. Thank you! HI, I’m using top round angus beef steak instead, should i still cook 8 hours on low? I wouldn’t do a top round in the crock pot. That’s best roasted in the oven. Bottom round and Chuck roasts do better in the crock pot. Cheaper too. Can this be made without beer? I would love to try this but since I’m muslim I can’t consume beer. Any alternatives? Thanks. Maybe you could try it with a can of coca cola or ginger ale, though I’d think you might want to cut down on the brown sugar considering how sweet soda can be. I think a bottle of (non-alcoholic) ginger beer could work well here too, as it’s not as sweet as ginger ale. Are you allowed non-alcoholic regular beer? That would probably be closest to the original recipe. I made this yesterday and it is so good! The juices…I put some in a small bowl and drank it. OMG! The meet came apart like there was no tomorrow. Leftovers tonight! Does it matter what kind of beer? I have miller lite in the fridge and am trying this tomorrow. I have a question?? 1st of this looks amazing! 2nd my husband is allergic to gluten which means no beer :( is there something else I could use instead? I’m just guessing but if I couldn’t use beer I would try it with beef stock or broth. Or I would use johnnys French dip au jus! Just to make sure: it’s two whole heads of garlic and not two cloves? Can you make it without the roasted garlic? Or if garlic can you use less or garlic powder instead?